How to view and edit the top level policy for all Azure APIs? Be default, Azure automatically creates a top level policy for all APIs. 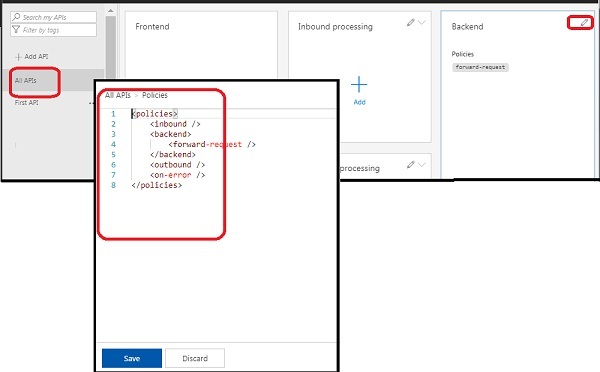 In the top level policy, the "forward-request" policy statement is added in the "backend" section automatically forward client request to the backend service. But if there is "forward-request" policy statement is not showing up in the effective policy, the top policy may have been modified or removed. Follow this tutorial to review or edit the default top policy. 3. Click "All APIs" from the API list. You see the design screen. 4. Click the "Edit" icon in the Backend section. You see the default top level policy displayed.